On Saturday morning, I felt an inner sense of lightness. 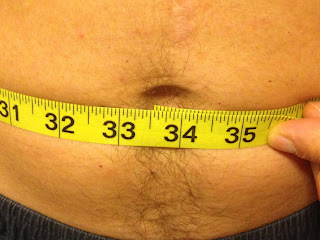 I could actually see a curve in my right side abdominal area that has been missing in action for some time. I measured closer to 25.25" around the narrow part of my waist, down from 25.5 fairly recently. It was up to 26 inches when I began this journey at the beginning of May. The photos taken on Saturday, June 17, after having consumed at least a liter of liquid, rather than upon first awakening. Here were a couple more, taken the next morning, prior to drinking a liter of water. I'm in a bathing suit a friend gave me. The hot tubs destroy the elasticity of these suits, so I'm in a serious need of a new suit. Grateful to have a hand-me-down! Rule #1: If you are working out, you may not notice a difference on the scale, but your body composition is changing. Keep at it! Trust the process. There is more going on than meets the eye! I have included some of the photos taken in May shown in previous posts (here, here,). You know I just love to flaunt of my puffy lower belly pouch. Actually, I more relish in sharing photos as they show the progress being made as that lower belly pouch incrementally diminishes! day after our meals. Don't remember if I ate something that led to bloating here or not. These two were taken June 4. Bad angle, makes me look mad, but I'm not! My lower belly 'kangaroo pouch' as I used to call it never fully diminished while on a high carbohydrate, entirely plant-based diet, despite being close to my ideal weight. Beyond these two times, the weight typically would fluctuate within a range of 5-7 pounds, but the body composition changed, along with accelerated wrinkling and aged look, and other issues outlined in the previous posts. Towards the end of eating a plant-based diet, we felt increasingly unsatisfied from what we were eating, and began to drift more and more towards eating the processed, higher protein vegan meat alternatives, along with more tofu, beans, greens, nuts and seeds. End of March, 2013 ~ 50th birthday. We looked at past photos of Don as well. You could say we both were sort of skinny fat. Only his body type is definitely more skinny overall than mine. 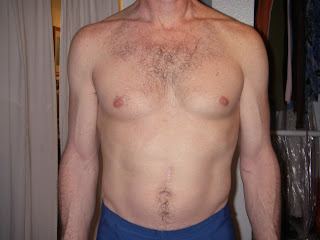 While his limbs were skinny, and he wasn't over weight, he had a flabby abdomen. 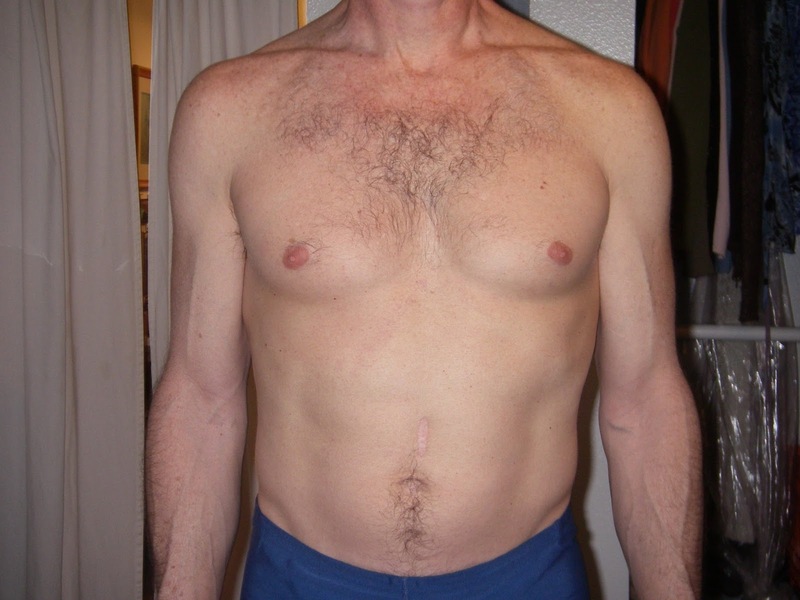 Since embarking on a very low carbohydrate diet, he has lost inches on his waist. He is down nearly 3 inches! He actually had a 34 inch waist prior to doing a month of eating a lot of wheat when this first picture was taken. An experiment to see if wheat was actually contributing to excess weight or fat. The wheat was filling, so he actually lost half an inch. The first three photos were from around 2 years ago, I believe. Look at him now! Actually, we don't have a current photo. This is from nearly 3 weeks ago! He has more abdominal muscle definition than I've ever known him to have. You can see more veins and musculature with each passing week. We'll get a more current photo up soon. Personally, I have much I would still like to see improve in terms of how I feel and look, including better postural alignment (not a diet issue in and of itself) and a further loosening of very tight musculature all along the right side. The right side is dominated by the liver according to Chinese medicine. So, while I continue to do the mobility and strength training to improve my alignment and fitness, I believe a continued reduction of inflammation ~ especially in my liver area ~ will have an impact as well. Reducing carbohydrates will lead to a reduction in insulin, and inflammation. Rule #2: Excess carbohydrate consumption leads to increased production of insulin. That is a fact. Excess insulin, especially over time, will lead to an increased imbalance in hormonal and metabolic functions, including increased fat storage. My assertion is that how well one tolerates consumption of excess carbohydrates will depend on their current condition and level of internal dysfunction, energy expenditure, genetics, age and other factors. Therefore, one can possibly consume a high carbohydrate diet for a long time and not notice a problem, depending on their lifestyle. And, while one may not observe an issue, it doesn't mean they are not dealing with a lot of internal changes as the body tries to acclimate to an ongoing source of food and fuel that is actually not preferential. I outline below those whom I believe will best succeed at eating an entirely plant-based diet, at least short term. I now believe we are not designed to eat that amount of carbohydrates, however again, one's ancestry and genetics can make a potential exception out of a small percentage of the population. Losing weight on a plant-based diet, at least initially, wasn't a problem. That success and a healing of my fibrocystic breast disease, and Don's prostatitis symptoms contributed to our believing it was 'working.' However, other issues developed over time. And most recently, several people began to visibly notice those changes. What I still want to see change now is a continued reduction in percentage of body fat ~ a goal I've not seen improve in over 5 years not. (Trust me, with how much I am working at this, that is frustrating!) I really want to reduce the unhealthful accumulation of body fat ~ especially in the lower part of the body ~ which seems the hardest to lose. Time to lose the excess fat on those chubby (albeit strong) thighs! In all honesty, I expect fat loss in my thighs to take several months, if not the better part of a year before they are at my ideal. Other of my desired outcomes / goals will take time as well, such as continued improvements in my skin, with diminished wrinkling ~ as much as Nature affords me ~ and greater brightness and clarity in my eyes, with improved vision. Here are a few more things to keep in mind if you are also experiencing slow progress with weight loss while doing this low-carb to very low carb/ketogenic diet challenge with us. According to the authors of Life Without Bread, those who are carrying the bulk of weight below the belly will probably take longer to notice results with weight loss. Women near menopause age tend to take longer to see results. Men who have skinny limbs, with excess fat primarily in the abdomen tend to have the quickest results. Some people gain weight initially before losing it. Getting fasting glucose reduced, and reducing insulin-spiking carbohydrates in the diet will bring about many healthy changes in the body. The duration of time needed to make some changes, including more visible changes to body fat composition, and changes to blood sugar balance will vary depending on your state of health when you begin to change your diet. It will also vary depending on where you carry your fat, your age, and activity level. Exercise isn't needed to get results, however you will be creating more lean muscle, which further helps to change your body composition, especially if doing some sort of strength training. Weight loss numbers may not change much, but you will be improving your fitness and strength. Keep in mind that increased muscle mass may cause you to weigh more, or appear to have stalled in weight loss, despite the positive changes. Also, exercise will increase your appetite. Eat as you are hungry, providing you are sticking to the low-carbohydrate foods. Primarily the right proteins and fats. 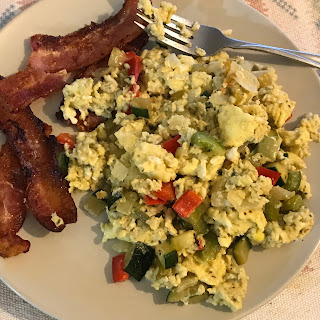 Another point I want to make is that our current plan is to continue to eat mostly just meat, eggs, and fat, (see the post, Go Extreme...) with whatever variety of animal proteins we feel drawn to for the rest of the month. We have had several meals free of produce, but still had vegetables we previously purchased that we were finishing up. The fats we eat are primarily beef tallow, fat from cooking bacon, butter, and xv olive oil, and whole fat dairy in the form of heavy whipping cream, sour cream and cream cheese. These are foods I believed I should experiment with eliminating at some point, as I wasn't sure if I may have a sensitivity to these foods. I still have woken up a few mornings feeling a little congested. Very likely it is from having the air conditioning on all the time now, pollen and cat hair. However, I was stuck on a thought that I 'should' eliminate the dairy for a little bit to be sure. Based on my experiment today, where I was trying to avoid the heavy whipping cream, I think I would have been better served eating the cream after our lunch. While trying not to eat the cream, I had a few handfuls of macadamia nuts (probably more total calories) instead as a sort of dessert post lunch. And, that ultimately led to abdominal distention. Otherwise, lunch was a simple thermos of broth with a little butter in it, and steak. Breakfast was eggs and bacon, and a little bit of liver. Rule #4: The mind can make you crazy. You don't have to listen to it all the time! As Don reminded me, I have avoided dairy foods for around 6 years, and even more in my past. I had a lot of phlegm, mucus and congestion throughout that time. And horrible allergies. It wasn't the dairy! It was the grain! I have had very little of these problems since changing our diet, even when including whole fat dairy foods. Not sure what I was thinking! Speaking of addictions, I still feel drawn in to all the colorful fresh fruits and vegetables when we go to Sprouts! Not as much, but this used to be my section to shop! Even when I look at some of my old food photos, filled with colorful fruits, vegetables, and winter squashes, I think, hmm, that looks vibrant. Must be healthy. Why am I not eating those foods again? Because they are not as healthy as we have been programmed to believe! Quite frankly, neither Don nor I are even craving them at all. It's just one of my 'parts' that is still sentimentally hooked on the thought of eating lots of fruits and vegetables. (Disclaimer: I'm not saying it is wrong to eat fruits and vegetables, I'm saying that they are not the most important components of building a foundation of health like we've been led to believe. In this challenge, eat as much non-starchy greens and veggies you actually desire, and feel good eating. Nothing more, nothing less. Don't eat any if you don't desire to! The amount and types of fruit you eat will vary based on your current health, and health goals. If you desire weight loss, or have hypoglycemia or diabetes, I would consider keeping fruit consumption to a minimum.) This brings me to another rule. Rule #5: Keep your meals simple. Eat what you crave of animal proteins and fats. Eat when hungry. Eat only the vegetables you desire to eat, and don't feel like you need to eat them at all. When Don and I used to go shopping, we would fill our carts with fruits and vegetables. Shopping is way more simple now. We go to the outer perimeters of the store ~ the cooler with eggs and cream, and the meat section. That's it. We are in and out. Putting it away once home is much simpler as well. And, while our grocery cart is less full when we check out, we certainly are getting a more calorie-rich diet ~ for less cost than trying to sustain a diet full of all those fruits and vegetables! Low on cash? Just buy lots of eggs, 80% fat burger meat (so delicious), and some butter and you can do this! You'll feel much better than eating fast food or junk from the corner convenient store! Last of our herb butter for now. Used up the cabbage. Not tired of burgers yet! and pour it on top of your Chicory Coffee, or other hot beverage. Top with cinnamon. Yum! This was a coffee made with butter and cinnamon. I have a stove top espresso pot. then butter and cinnamon or cream. Hits the spot. Minimal jolt. cooked in butter. More Egg-Cellent Egg Recipes here. The relevant books I am currently reading are: Life Without Bread, and NeanderThin, both of which I highly recommend. I recently found (as in it was lost) Dr. Kellyann's Bone Broth Diet, a library book I thought I had returned prior to having a chance to read. The library kept sending me over due messages, so I thought it was somehow lost in transit. Well, I found it the other day, under the car seat, exactly where the librarian mentioned to look. Needless to say, I scanned through it and took some notes before returning it. I thought I would share an overview of a few different ways each of the authors and other online sites have outlined how to implement a low to very low-carbohydrate diet. There are many similarities, with a few differences. This way, you dear readers can look at the various options and determine what may work best for you. You can read the parameters we originally spelled out by clicking on the 30-Day Challenge tab at the top, linked here. I also want to share Dr. Kellyann's basic bone broth recipe, as I decided I needed to up my game with our bone broth. Collagen is precisely the nutrient required to improve our skin, and diminish those carbohydrate and insulin induced wrinkles! I'll include the recipe, and my variations, in a separate post as well. Since I have had a history of gastrointestinal issues (GI), I will share some passages from Life Without Bread on this topic in the next post. (I had it here, but post got too long.) I have attempted to research for some time any source that could indicate to me how long it takes to heal from various GI issues. This book provided some answers. Anyone else who has a history of constipation, or other gastrointestinal issues, including Chron's, may especially want to read their book. In the very least, know that there is hope for healing many conditions by eating a low-carb diet. I have days where I don't quite hit my mark in terms of eating appropriately. I still have some water retention and inflammation. My left eye is still a bit puffy when I wake up some mornings. It again could be a circulation issue, a sleeping pattern (lying on my left) or even due to the ceiling fan + ac that does bother me a bit, however, swelling under the eyes usually indicates an issue with the kidney(s). It could be too much sodium. Over the weekend I attempted to make pancakes. I wanted them to have plenty of eggs. Well, then I needed more 'flour' of some sort. I used a blend of coconut flour, ground almonds, and hemp. All of which are pretty high in fiber. The pancakes were not my best, and I didn't feel good (more mentally/ emotionally and energetically) after eating them. I didn't exactly feel bad, (actually I had a fleeting sense of sadness), but I had a distinct sense of connecting my past symptoms and even moods to consuming excess carbohydrates and fiber. I feel a sort of sadness immediately now when not providing my body the foods that help me feel my best. It contrasts to how good I feel ~ physically and emotionally, mentally and energetically ~ when I eliminate those high-fiber, carbohydrate-rich foods, and eat more fat! All this just reflects to me the level of ill health I had, and am working to change. And, I know I have a fresh opportunity each day. Each symptom provides me with more knowledge. It's great to sleuth out what helps me to feel my best, and which foods trigger uncomfortable symptoms. I think many people crave carbohydrate-rich foods when depressed, and now I see why. It is unfortunately a short term fixe with negative long-term consequences. We simply must find healthier ways to fill ourselves up with the sweetness of life, rather than indulging in sugars in all it's various disguises. (All carbs break down into sugars. All of them.) Sugar is like a drug. We become desensitized and require ever more hits of it over time. When you get your needs met from the right sources, it changes your brain chemistry, and can greatly help with eliminating or reducing depressed mood states. The more I read about the havoc that over consumption of carbohydrates can wreak on our physical and even mental health, the more I'm convinced that I will continue some form of low-carb dieting from now on. How much produce I end up eating, and what types, along with what I find my personal safe maximum carbohydrate intake to be is still up in the air, but doubt it will ever surpass 72 grams, the amount recommended in Life Without Bread. Either keep total fat really low (excess carbs + excess fat = bad combo) which I don't think is healthy, and can lead to neotany, reverting in look to being quite young in an immature way or to a gaunt, pre-mature aged look; or find a way to do a higher fat and protein plant-based diet, which will ultimately end up including a lot of foods that are not ideal as well, such as soy-based foods, protein powders, or a lot of beans, and nuts and seeds. Each of these foods have inherent draw backs which can lead to sometimes undiagnosed problems, including leaky gut, and a whole host of GI issues, among other problems. Proceed with mindful caution. Here are the related books and resources I recommend. We have been loving our Chicory Coffee drink (no actual coffee in it). We are using the Prewetts which happens to be organic. Stay tuned for more to come!